OSHA Orange Surface Protector provides visible heavy duty floor and surface protection. Safeguards hard and soft floor, wall, cabinet and countertop surfaces. OSHA Orange Surface Protector is great for protecting concrete, brick, stone, terrazzo, tiles and resilient floors. Safeguards everything from boating decks to hospital flooring from damage and exposure. 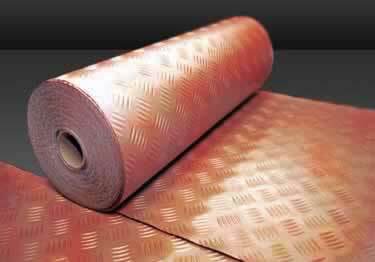 OSHA Orange Surface Protector is flame retardant and comes in 13, 25, and 40 mil thicknesses in both 3 foot and 6 foot width rolls. How is the product installed? I am looking to cover a concrete floor that will be the finished product and I want to keep from scratching or chipping the concrete. Do you tape the seams or is there a sticky side? I want to keep it down for weeks to months. A contractor is planning to use this product to protect vinyl floors in a corridor in a college. Is this product slippery when wet? I have a project where I need to protect workers from falling objects and some welding sparks/slag in a 6 story process tower which has carbon steel grating as the flooring. Will this material hold up to human traffic on grating and will it hold up to hot welding slag? Once per year for July 4th fireworks, we place 4x8 flakeboard over our Trex docks to protect them from fireworks damage. Would this product compare to flakeboard for protection? What is the weight of 30'x 6' section? What is the weather durability of this covering? I have a project that i have to protect the existing carpet, can i use this proct on top of carpet? How would i have this product adhear to the carpet with out leaving a residue on the carpet? This would be for a heavy duty restaurant kitchen ,looking at the 40 mil orange flooring . Would you recommend this flooring type and how would you adhere it to the sub floor ? OSHA Orange Surface Protector provides heavy duty, fire rated protection for hard and soft surfaces. Available in 13, 25, or 40 mil thicknesses. Thank you for the review. We very much appreciate your compliments about our fast delivery. If we can ever be of further assistance, please don't hesitate to give us a call.